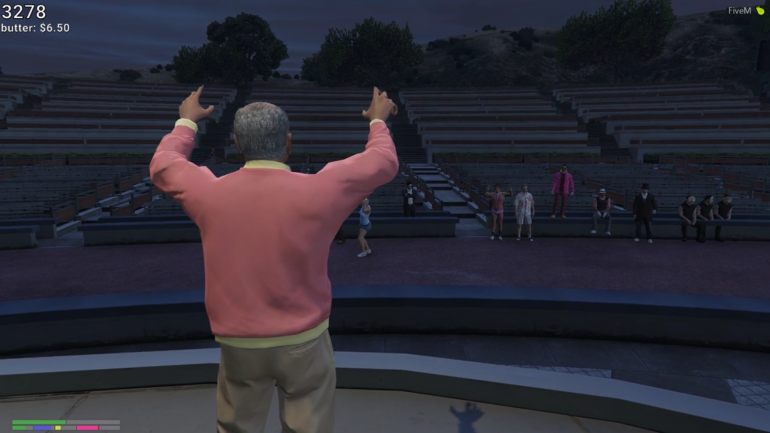 Forsen and Vader put it all out there in GTA V.
As the popularity of Grand Theft Auto V roleplay servers continues to explode on Twitch, several big streamers got together and put on a talent show to prove they were better than their friends. Vader and Sebastian “Forsen” Fors specifically played their roles well, with Forsen’s character, Sven, proceeding to saw Vader’s character, Eugene, in half. Sven asked Eugene to step behind the curtain before hitting him with a hammer. Once that was done, a second player emerged with only half a body, crawling around on the stage floor. But that wasn’t the what drove the streamers’ fans wild. Instead, Eugene did his own rendition of “Next Hype” by Tempa T while staying completely in character, which is that of an elderly man. Vader spit the 10-year-old song, adding in his own twists to reference his past experience role-playing. This included a nod to Prune Gang, a group of elderly characters that his own character, Eugene, is one of the leaders of. At the end of the event, Eugene was awarded the top prize by a panel of judges, while Sven didn’t even place within the top three. According to one of the judges, the reasoning was that his trick didn’t include actual magic. Sights like this are only growing more common as more players jump into the GTA V roleplaying scene, and streamers like Forsen, Vader, and gangs like the Leanbois will likely lead that charge.